Hi guys in this article I talk about indian browser and uc browser. so please stay read to know what is best browser to use. Basically I talk about features, download speed and etc. This two browser are best for browsing. And important thing is uc browser is product of china.but indian browser is product of India. indian developer said that if stop use UC browser for 2 hours then China loose 10milion rupees. This price is not exactly that I said. 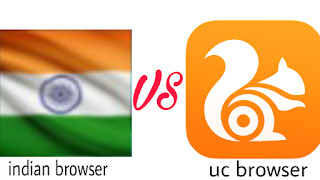 So in this article i talk my opinion about indian browser and UC browser. After my research, for browsing indian browser is the best but download and some features are not really good to use in this indian browser. But indian developer need to focus on develope of Indian browser for some important features​ that's are missing. Let's talk about uc browser. uc browser is most popular browser all over world. because of features and speed. uc browser features and speed are awesome. for the sake of all guy are love uc browser to use. First of all for browsing uc browser slow comparasion about indian browser. but uc browser is too good. then download speed is awesome out of all over any browser. uc browser give us 20 tab to use. and uc browsers ads are similar. basically this app is comfortable for us. Indian browser is like chrome but not same. Indian browser almost missing all features. if you want to use indian browser then I recommend for you, no. indian browser is good for browsing not best and download speed is too slow than uc and chrome. no tab available to use. and more ads appears when open indian browser. basically you must going to iterate. and here I mean in this indian browser have only 2 language to use. But uc browser have more than 6 language. At last uc browser is better than indian browser. Infact I think indian browser is fake browser. some guys is trying​ to make money from this app. My opinion indian browser is not good to use. this is fake browser for income. this is wrong way to make money don't use indian browser. I recommend you to use uc browser. If you have any questions about this article then comment bellow. And don't forget to like our Facebook page .